It was supposed to be simple, a warm-up for the real climbing. But, one small navigational error, mixed with some consistently bad decision making, turned our supposedly easy journey into an epic that would be impossible to forget. 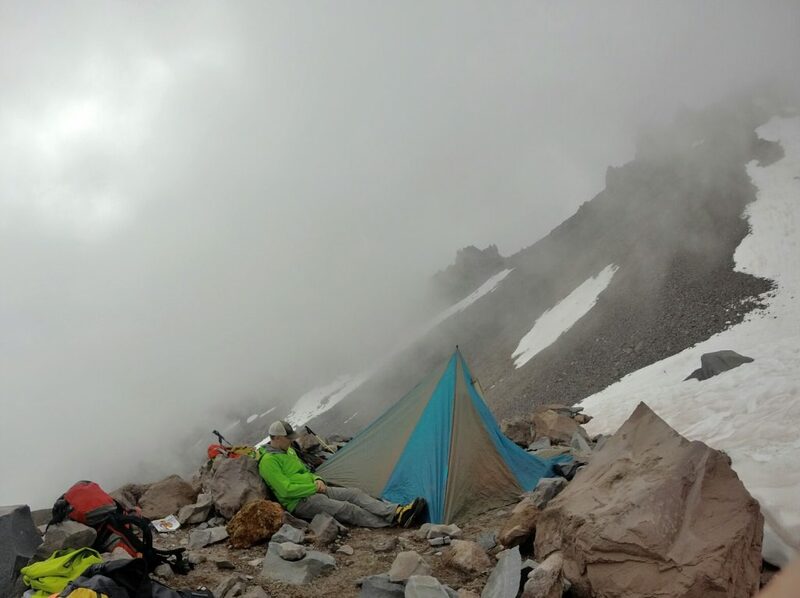 Two long-time friends, my wife, and I had hiked from Mount Shasta’s Bunny Flat trailhead to Lake Helen, where we set up camp, cooked dinner, and went to bed early in preparation for an alpine start and summit attempt. The following morning, the alarm came quickly, at a time most would consider more night than day. 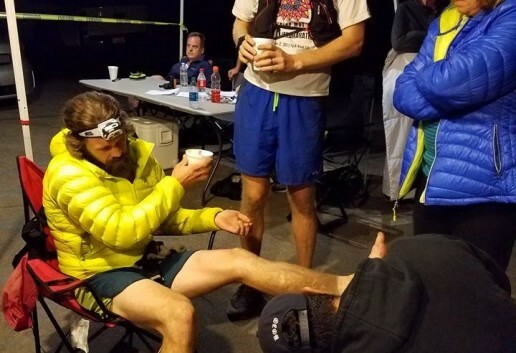 We slowly crawled from our sleeping bags and began to layer up, fill water bottles, and pack our bags for the big day. Our plan was to summit, return to camp, pack it up, and head back to the car at Bunny Flat. Over the course of the day, we would climb almost 4,000 feet and descend more than 7,000, all at an altitude unfamiliar to us four East Coasters. The alarm came quickly, at a time most would consider more night than day. 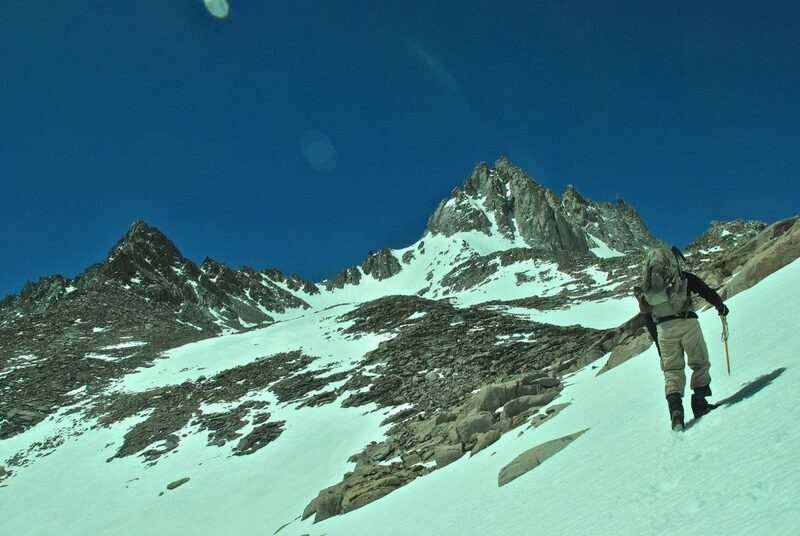 We left Lake Helen around 1 a.m. and moved up Shasta’s icy, steep slope toward the day’s crux: the Red Banks. Passing through the Red Banks was our chosen route’s one real challenge, and climbers have two options: Attempt the steep-ish chimney that runs through the Red Banks, or hike around them. We had elected the former option. Roped up as a team of four, we made consistent upward progress through the early morning darkness, frequently stopping to check the GPS to ensure we were heading the right way. Here, however, is where we made our first mistake. 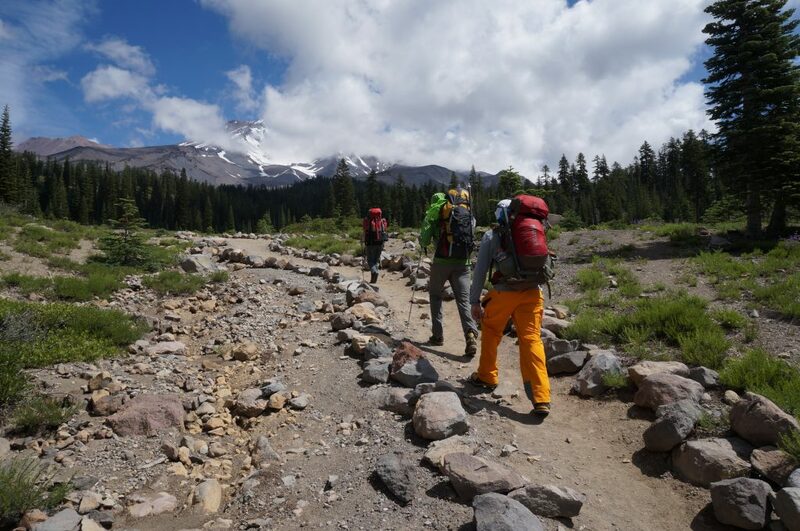 Two of us had previously climbed Mount Shasta’s Avalanche Gulch route, and despite what the GPS said, we both felt like we were being pulled too far right, away from the chimney and toward the end of the Red Banks. Arriving at a cliff band with the sun beginning to rise, we realized our mistake. In fact, we trended too far to the left, missed the chimney, and were facing three options: One, traverse the icy slope, locate the chimney, and continue up the mountain, taking a time and effort penalty for our navigational misstep; two, descend back to camp, cut our losses, and begin preparing for the climbs on Shasta’s north side, the real reason we came here; or, three, just go up! The only way out was up. Of course, nothing is ever as simple as it seems. After climbing one rope length, we discovered the cliff was bigger than we initially judged, leading to another rope length of technical climbing. 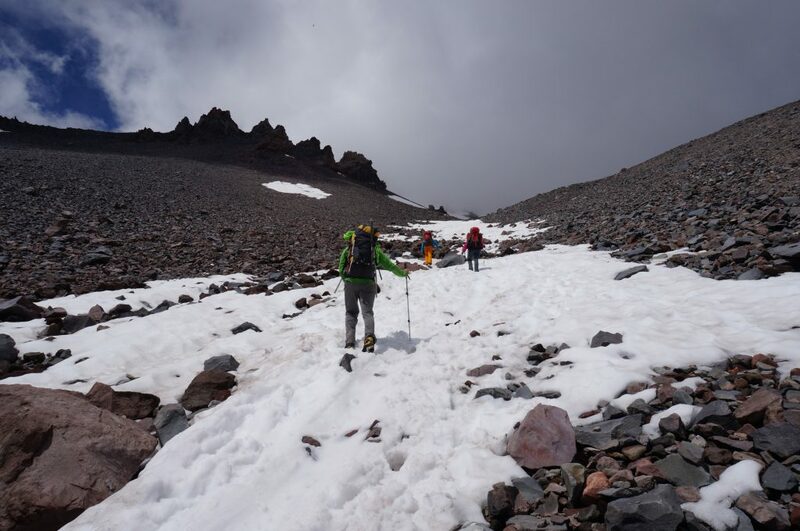 After that, we ascended a steep snowfield, which brought us to a steep scree field, which further led us to another steep snowfield, all with bits of semi-technical climbing on crumbling volcanic rock (Type 2 Fun on its own) mixed in. At no time did we see or run into the Avalanche Gulch. 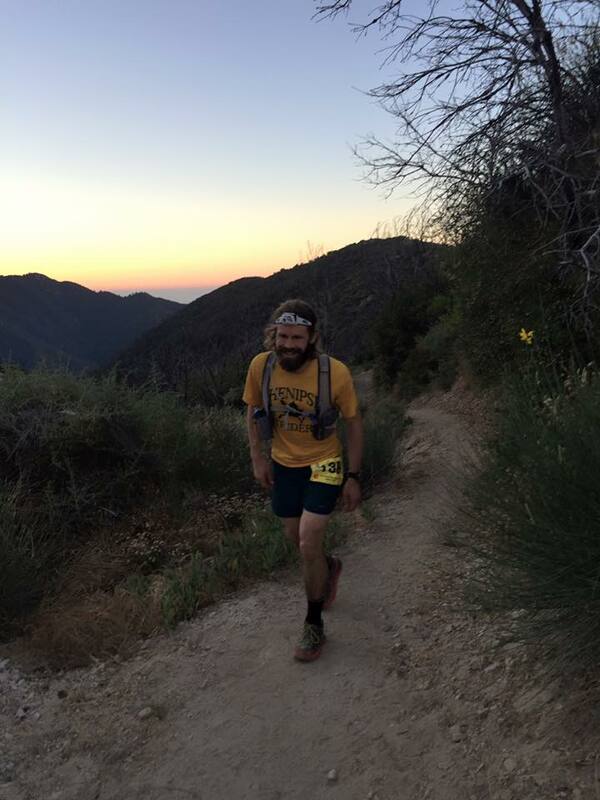 It dawned on us pretty soon that we had climbed onto Casaval Ridge, one of the mountain’s more aesthetic lines and a far more challenging route. The good news was that we knew where we were and knew that if we continued climbing, we would, in fact, intersect with Avalanche Gulch eventually. The bad news was that the climbing was slow, we had only packed food and water for a quick summit attempt, we’d been on the go for a long time, nerves were getting frayed, and there was no turning around. From our location, reversing our route would be much more challenging and time consuming. The only way out was up. The early morning’s psych had worn off, and no one was having fun anymore. When we stopped to belay, there was nothing but silence, as everyone was locked into their personal bubbles of suffering and anxiety. 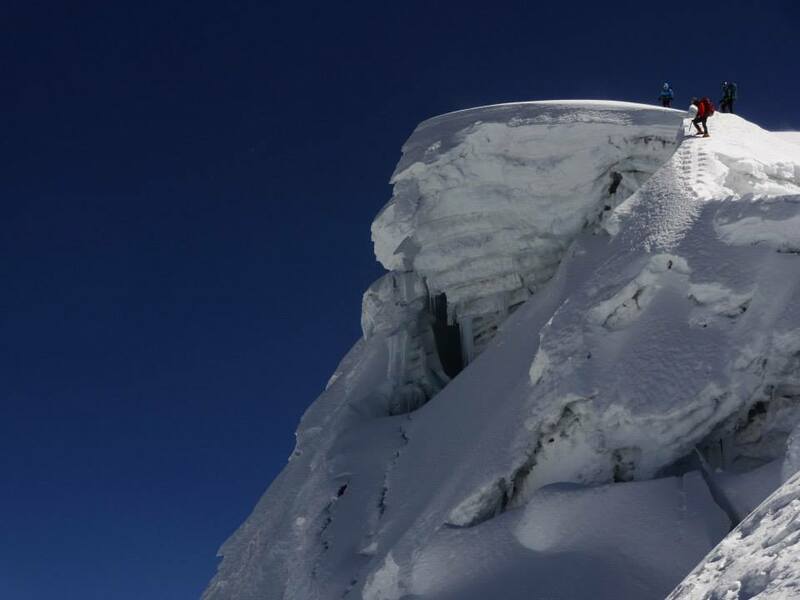 Each time we reached the top of a snowfield or cliff band, there was a moment of anticipation, with everyone hoping that we’d finally get to familiar territory, but it was followed by disappointment when we realized we had yet another obstacle to overcome. We’d been on the move for almost twelve hours when we encountered the crux of Casaval Ridge, The Catwalk. As the name implies, The Catwalk is a narrow section of rock and snow measuring between one- to two-feet wide, with a bulging wall of loose rock on your left and the abyss on your right. 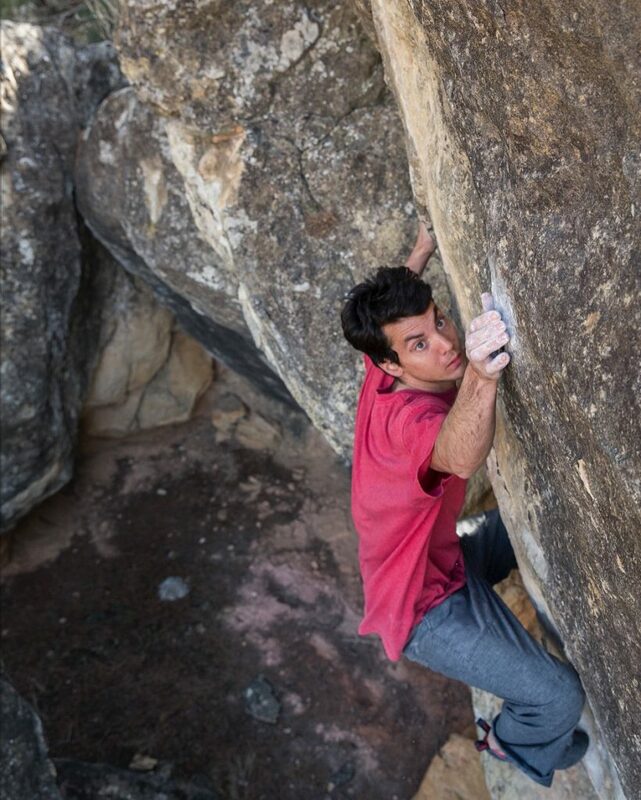 While not technically challenging, it is a heady bit of climbing, with dire consequences if you make a mistake, and not exactly the place you would want to be if your original plan had you cracking beers in the parking lot by now. Never have people been so happy to see a place called Misery Hill. Reluctantly, we climbed The Catwalk—what other choice did we have? It was also here where the day assuredly became Type 2 Fun, as a few tears were already shed. Luckily, after The Catwalk, the terrain became easier, and we could now clearly see Misery Hill, the place where Casaval Ridge and Avalanche Gulch join. Looking back, never have people been so happy to see a place called Misery Hill. Below Misery Hill and off Casaval Ridge, we sat in the afternoon sun while nibbling on our remaining food and sipping the last of our water. 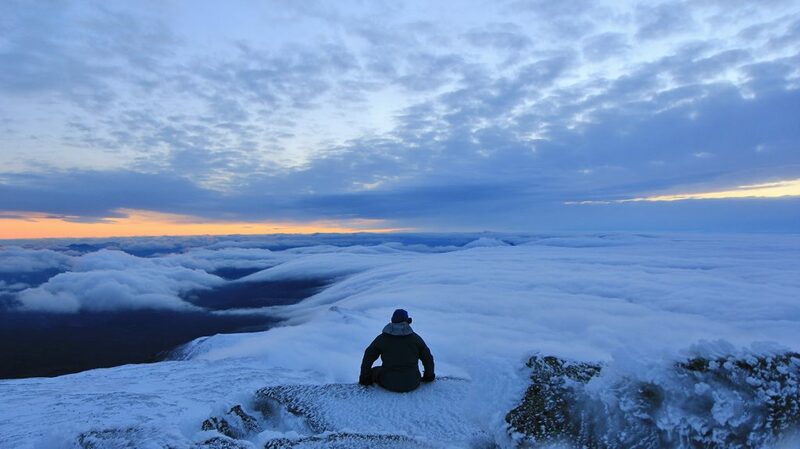 With the summit in sight, two of us made a push for the top, but our hearts were no longer in it. A couple hundred feet shy of the summit, we turned around, picked up the other two, who were sulking at the base of Misery Hill, and descended Avalanche Gulch toward our camp at Lake Helen. There, we ate, drank, and packed up before hiking back to the car and the promise of hot meals, cold beers, and comfy beds in town. 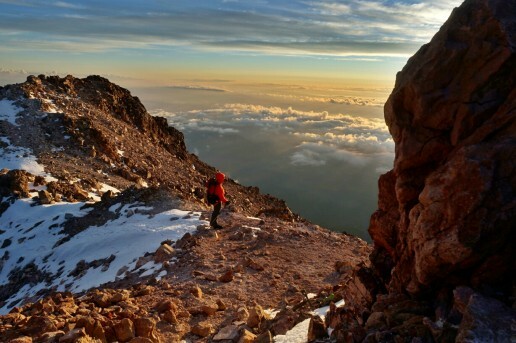 After a day of relaxing, we went back and climbed Mount Shasta via Avalanche Gulch efficiently and without incident, summiting in the early morning with the peak to ourselves. But, we never did make it to Shasta’s north side. Over the course of our two trips, we only summited once, but got to experience two types of fun. I guess we should consider ourselves lucky we didn’t experience the third. 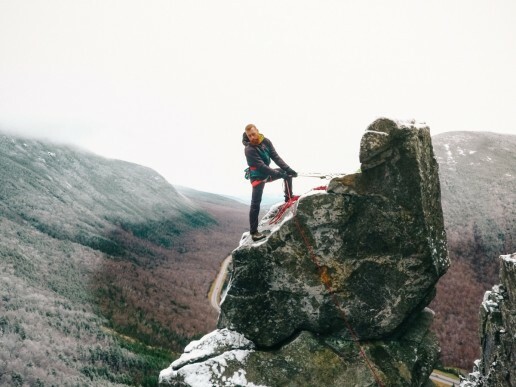 The Eaglet is New Hampshire’s only free-standing spire and, for climbers wanting a majestic adventure, is home to a few separate routes, with West Chimney (5.7) being the most popular. In 1929, Lincoln O’Brien and Robert Underhill recognized this beautiful structure and decided to take a closer look, unknowingly making the historic first ascent of a soon-to-be classic. My alarm rang: It was 5:45 a.m. as I jumped out of bed, straight into my approach shoes. I was so excited that I hardly noticed the lack of sleep. After packing my car, I drove two hours north to meet up with my climbing partner, Justin. We immediately began to discuss the routes on our objective, The Eaglet. As we conceptualized over some hot tea, we realized that the mountain face would only make this climb much more epic. Justin and I began our short but steep 30-minute hike to the base. After some back-and-forth banter, we finally geared up. Due to the icy conditions, we discussed minor changes to our route and decided West Chimney was the best line of ascent. Justin and I climb often and have attempted many different crags, but nothing compared to The Eaglet on this day. West Chimney’s first pitch begins to the climbers’ left. Justin started on the first lead, threading his way up ledges and shallow corners on the spire’s left-hand skyline. Given the abnormally difficult conditions, I had decided to relinquish the sharp end, which was made easier by my partner’s vast experience in this type of dicey terrain. Playing into your partner’s strengths is the key to success and safety in the mountains, and this day was his turn. Given the route’s circuitous line of ascent and the wind carrying our voices off into the void, we came to a resolution: to use an age-old mountaineering formula for voiceless communication. This code—primitive at best—is based on sharp, distinct rope tugs: Three clear pulls indicate on-belay. When you’re climbing multi-pitch walls, communication is critical. Soon after Justin started out, I heard a holler of elation and subsequently felt three tugs. I got ready and began climbing, only to realize how icy the first hold was. I continued up toward the route’s first crux, a small ceiling you need to climb up and around. There, I spotted a piton so old I assumed it was put in place by the first ascensionist. About 15 feet past this section, the climb got pretty slabby. This forced me to move quickly, so I didn’t slip. After crushing through this part of the journey, I headed up and left to a loose and snowy vertical gully. A few tricky moves placed me at our first belay atop a ledge, where I joined Justin with a huge smile. 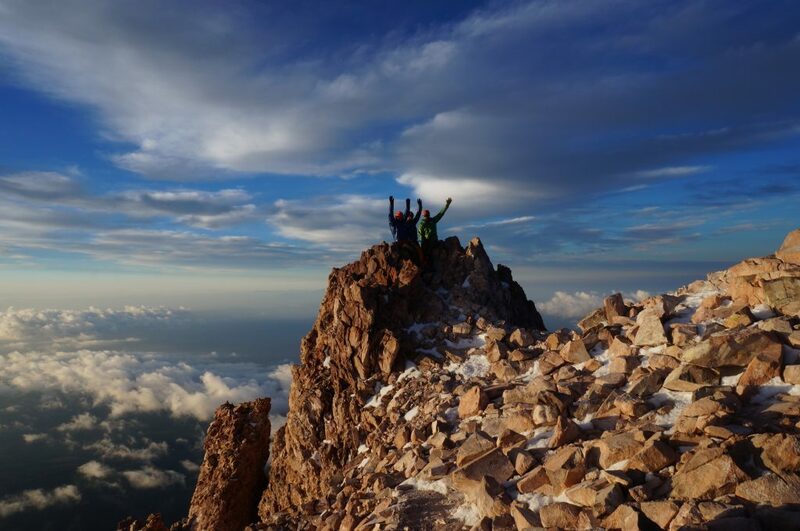 With the energy of pure enjoyment, we were determined to get to the top. The next pitch—my favorite—was a 60-foot crack, one splitting two walls and big enough to wedge our bodies into. After we snaked our way up using all sorts of abnormal moves, we reached the coolest feature: a chockstone the size of a Smart car blocking the crack’s exit. Still short of desperation and driven to succeed, I dug my way up. Trying so hard, I couldn’t help but look like I was in a cage fight. Justin began to laugh after witnessing my unusual facial expressions. After grunting my way up to the second anchor, I once again reunited with Justin’s energy. He gets so stoked over climbing, and honestly at this point, it had completely rubbed off on me. 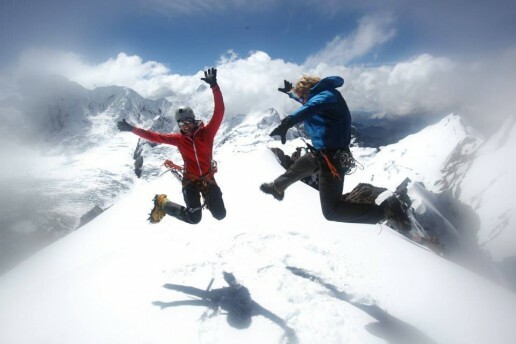 It has been said that climbing is 90-percent mental. So, with this perspective, I’ve never had an unhappy moment out on these vertical adventures. That was an obvious understatement. My eyes widened and my heart began to race from the exposure. Franconia Notch shimmered from a light dusting of snow and ice glimmering in the sun. After one final hold to the top, I was standing next to Justin, looking at what we had just climbed and taking note of what we were actually standing on. This view once again made me speechless. Here we were, standing nearly midair with nothing but the White Mountains and an energetic atmosphere surrounding us. This was hands down the most epic journey I’ve done in my two years of climbing. I cannot wait for the many more Justin and I will plan together and accomplish in the future. 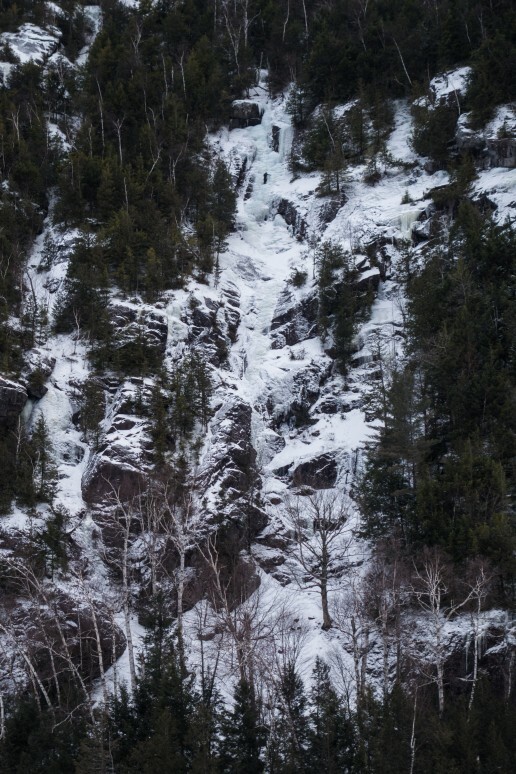 “I hate winter,” “I hate snow,” and “I hate ice” are commonly heard phrases throughout the Northeast during the winter months, but not from our guides at the Eastern Mountain Sports Climbing School. 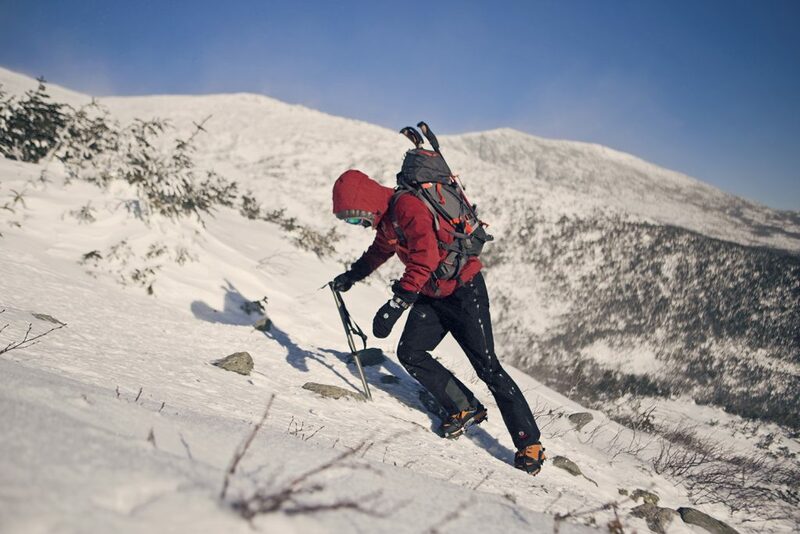 In fact, for many of them, this is prime climbing season, and whether they’re scaling the popular Lion Head route on Mount Washington or the famed steep ice of Frankenstein Cliff, they’re sure to be carrying an ice axe. However, with so many different types on the market, knowing which one to pick can be difficult. 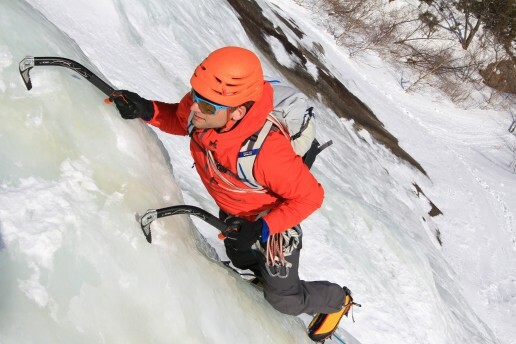 To help make your decision easier, I spoke with EMS Climbing School manager Keith Moon to gain some insight into how to find the right ice axe, depending on what you hope to accomplish in the mountains. Mountaineering axes are distinguished by their straight shaft, adze (the flat, wide end of the head used for chopping steps in hard snow and ice), and classically curved pick, and they are staples of our school’s winter Mount Washington climbs. For these journeys, the EMS Climbing School uses Petzl products and has seen the Petzl Glacier axe dutifully accompany many to Mount Washington’s summit over the last couple of years. Although the Climbing School loves this model, our EMS stores carry a wide assortment of general mountaineering axes, including the incredibly popular Black Diamond Raven. An essential item in any mountaineer’s kit, this axe used in combination with crampons is how climbers protect themselves when attempting low-angle terrain. 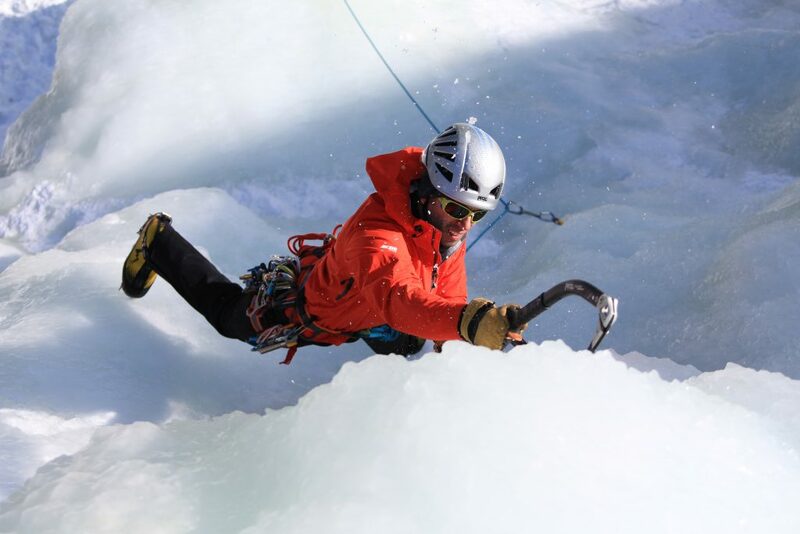 The axe, when plunged into hard snow and ice, can be used for increased stability, while the pick allows climbers to self-arrest, or stop themselves, in the event of a fall. Even though this tool sees most of its use on Mount Washington by the Climbing School, Keith has occasionally tested its limits on some steeper routes with clients preparing for major trips on bigger mountains. Not sure what length you need? Keith recommends that, when sizing a mountaineering axe, customers hold the head of the tool and let it hang by their side. When it’s sized properly, the spike should hang around the ankle bone. Hybrid axes represent the most niche tool the EMS Climbing School uses, and Keith admits that his Petzl Sum’Tech sees the least amount of action out of all the axes in his quiver. 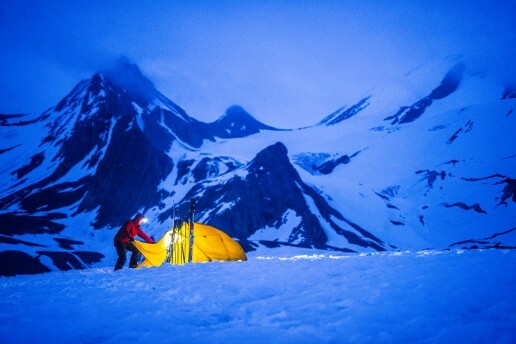 However, he is quick to remind us that having the right tool for the job can be the key to success in the mountains. As the name implies, hybrid axes split the difference between their mountaineering and ice counterparts. They feature a slightly bent shaft for clearing ice bulges on steeper terrain and a more aggressive pick for ascending steeper sections of ice. The Petzl Sum’Tec axe is the choice of many EMS guides for tackling objectives that blend steep sections with more moderate terrain. With an adjustable hand rest, the Sum’Tech can transition from a traditional piolet to a capable climber quickly and easily. Keith says that climbs such as Willey’s Slide and Shoestring Gully are great examples of when a hybrid tool is ideal. While the Sum’Tech is an excellent tool, the Black Diamond Venom is another great option that EMS carries in its stores and online. 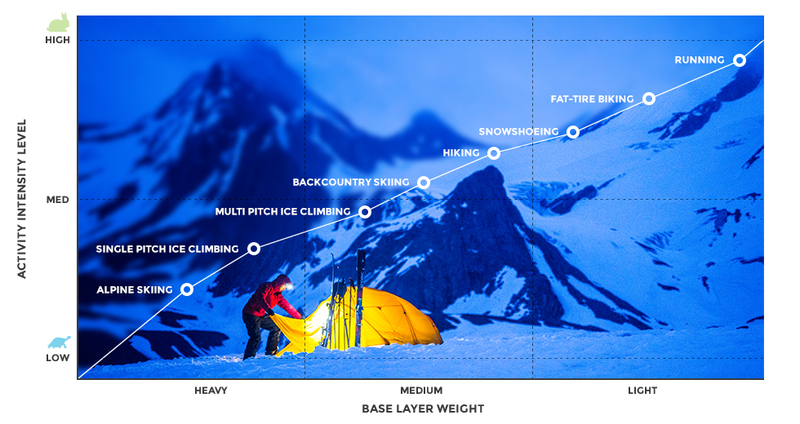 With their radical shapes, shorter lengths, and more aggressive picks, ice-specific tools look significantly different from their mountaineering brethren. In fact, they can even appear distinctly different from other ice tools, depending on if they have a recessed handle or not. You will find both tools with recessed handles, like the Petzl Nomic, and models with non-recessed handles, like the Petzl Quark, at the EMS Climbing School. So, what’s the difference? Those with a recessed handle pivot at the pointer finger, while non-recessed ones do so at the pinky. Keith says, “Neither one is better than the other. What matters is that the tool swings naturally to you.” Either recessed or non-recessed, these are designed for high performance on steep ice. Keith’s biggest piece of advice about ice axes is, try before you buy. Ice tools are a big investment, and you’ll want something that feels good in your hand and swings the way you want it to. Whether you take a lesson with the EMS Climbing School and put our Petzl tools to the test, or attend a demo or ice fest, try swinging several before you commit to buying. Keith also recommends bringing the gloves you’re planning on climbing in to the store with you. It’s amazing the difference a glove can add to the feel of an axe, he explains, and just because something seems good in your bare hand doesn’t mean it will be that way with your gloves on. The fact is that Eastern Mountain Sports carries a bunch of great ice axes, and we have only mentioned a few here. I for one am anxious to swing the CAMP X-Dream. If you’ve been dying to get a new model for your winter Mount Washington trip, or have been looking at a new set of tools with the hope of stepping up your steep ice game this season, stop into an EMS or check out our selection on EMS.com. Of course, if you want to swing them before buying, give Keith and the guides at the Eastern Mountain Sports Climbing School a call, and see if you can check out their Petzl axes. While you’re there, maybe you can get them to run you up that dream line at the same time. Winter is finally in full swing here in the Northeast, with the mercury hanging well below that magical 32-degree line in many places. And, that can only mean one thing: ice! 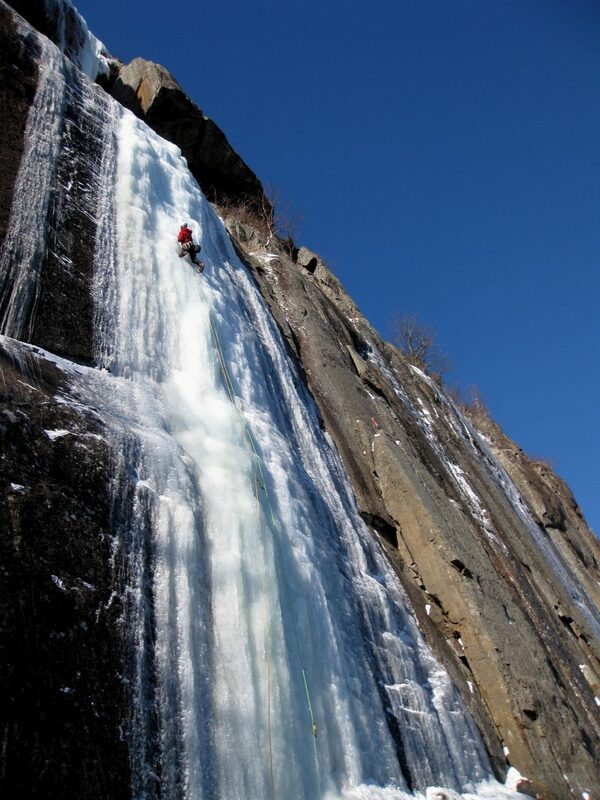 Whether you’re a seasoned ice climber or a beginner just looking to get that first taste of vertical water, Lake Placid and the Adirondacks are home to some of the United States’ best and most accessible ice climbing destinations. 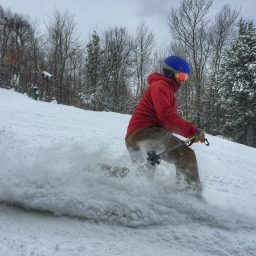 The area offers varied terrain—from shorter, low-angled waterfalls to longer, more difficult routes—making the Adirondacks inviting for all skill levels. 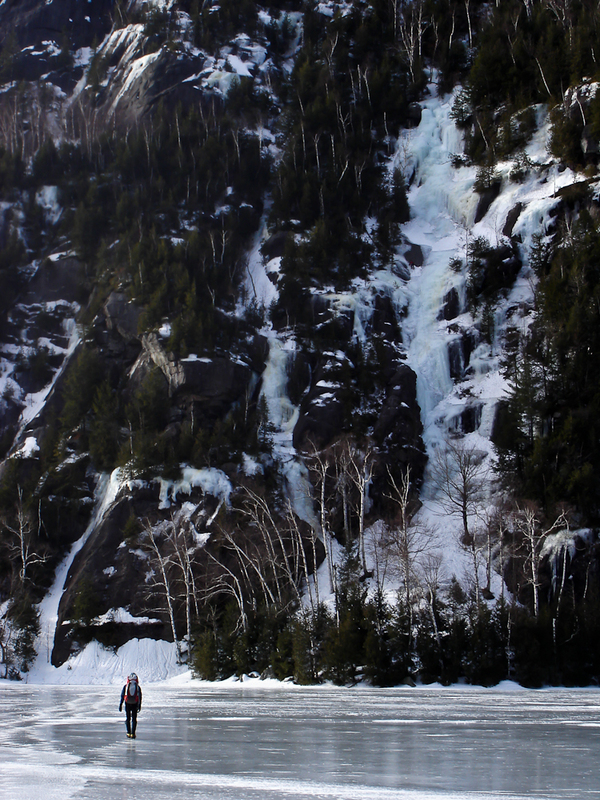 What’s even better is, EMS offers a range of ice climbing and mountaineering courses out of Lake Placid, tailored to your skill level. 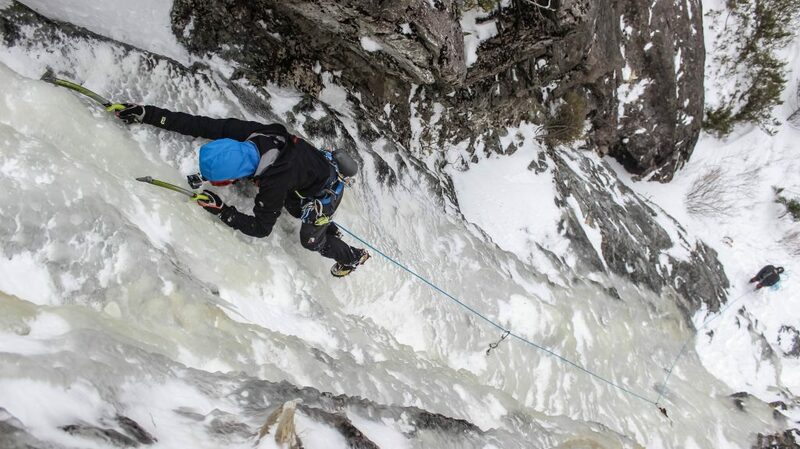 We caught up with EMS Climbing School guide Will Roth to get you the low-down on climbing Adirondack ice. With so much energy and passion for the sport, Will inevitably became a guide. 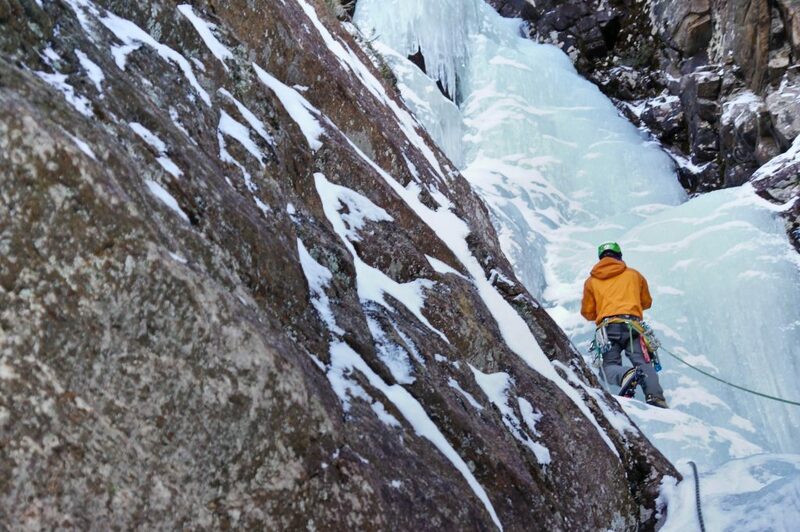 Inspired by a great climbing mentor who was a guide himself, Will found his niche in the Adirondacks, running an ice climbing program for the Boy Scouts. He transitioned into his role as an EMS guide from there. If you do take an EMS course in the Adirondacks, rest assured that you will be outfitted with all of the proper technical gear to move on steep snow and ice, as well as expert instruction to give you a full understanding of what’s required to climb ice in the wintertime. This is the route that Yvon Chouinard and his crew supposedly climbed during their historic 1969 visit. 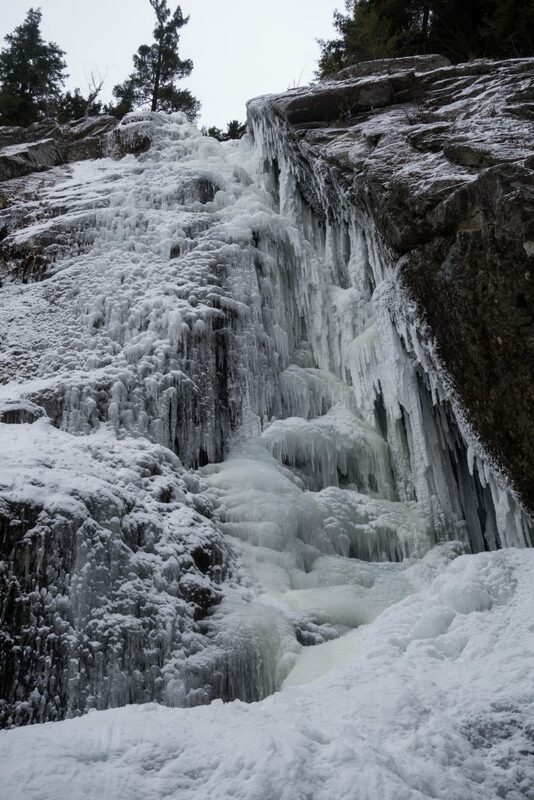 It’s three pitches of moderate ice, with the first being the steepest. Although you can rappel the entire route, walking off down a trail from the top keeps congestion on busy days to a minimum. This one is a classic and can get busy. If this route is in, get on it! It’s a long day, no matter how you do it. 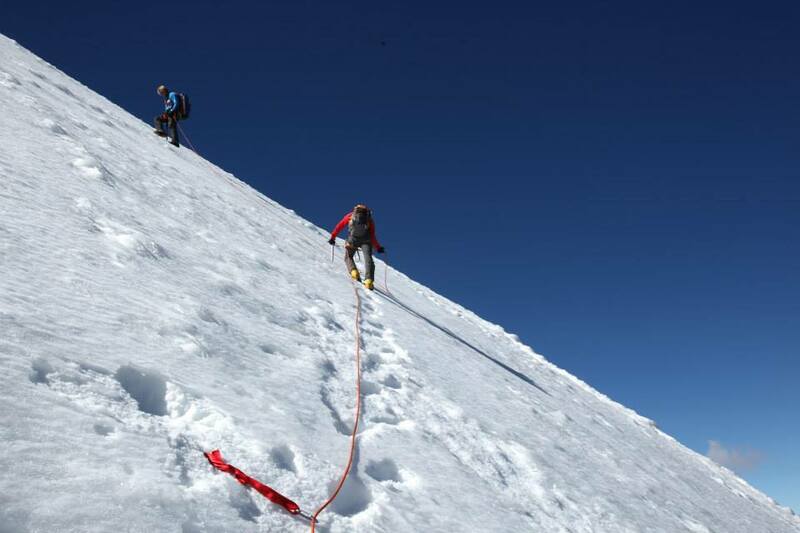 After a several-mile approach, three moderate pitches lead to the top. The first is the steepest, and after that, the higher you get, the easier the angle. Good map and compass skills and an overnight kit are a must on this excursion, especially if the weather is bad and visibility low. Most doing this climb for the first time significantly underestimate the time it takes to go from car to car, but it’s probably the Adirondacks’ best route of its grade. In the Adirondacks, we don’t have many climbs like this. It is a true gully, with steep walls on either side. Two pitches of moderate ice top out at a cliff that has vegetation so thick you better rap off. This climb truly is a gem, and being tucked back into a cliff with views out toward Whiteface Mountain really makes it stand out. This is the big, hard route. The initial long, just under vertical first pitch can be deceivingly thin, while the second pitch is short but steep! And, the last pitch is a fun romp to the trees. Topping this climb out is always satisfying! On a below-zero degree day in the sun, this three-pitch moderate climb is where you want to be. Because you’re climbing a “live” feature, there are always interesting ice formations. More than other ice climbs, this one forms differently every year. 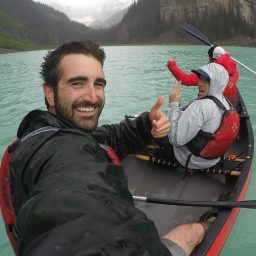 Editor’s Note: Have you ever wondered what items professional athletes and outdoor adventurers put on their wish lists? Because these folks know their stuff, we asked a handful of experts in different fields to tell us what they want for the holidays. 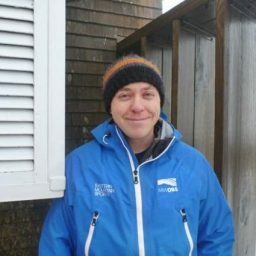 Since 2005, Ryan Knapp has been a weather observer and meteorologist at the home of the world’s worst weather, Mount Washington. At 6,288 feet, Mount Washington’s summit, the highest in the Northeast, sits at the convergence of several different storm tracks, giving it notoriously erratic, extreme, and even deadly conditions. The second-fastest wind speed on Earth—a staggering 231 mph—was recorded on the peak, and it has seen temperatures as low as 47 degrees below zero. And, it’s Ryan’s job to both keep track of it and try to predict what’s coming, which means he needs top-of-the-line gear. While the summit has an average snowfall of 281 inches, most of this is scoured off by our high winds, which then leave it as a giant dome of ice with hard-packed snow on the leeward sides. As a result, a solid pair of crampons, like Black Diamond’s Neve Straps, are an essential item for working on the summit, whether it is going to gather the precipitation can, repair an instrument, or go out for the occasional SAR effort. 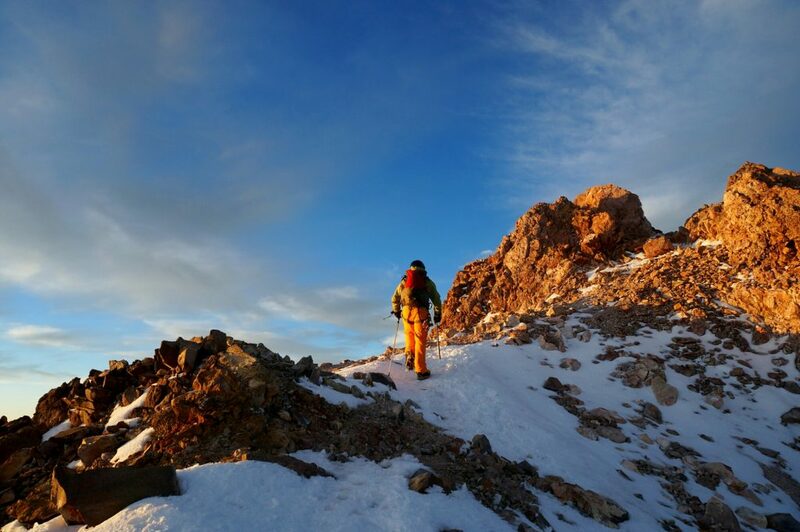 In the heart of winter, crampons are essential, but in the shoulder seasons (specifically, spring and fall and even occasionally summer), they might be slightly overkill. However, it can still be slick, and in these situations, MICROspikes® are great for providing added traction between your bare boots and crampons. Once you strap these on, whether you’re on the summit or after work in Boston, you will wonder how you ever got around in icy conditions without them. 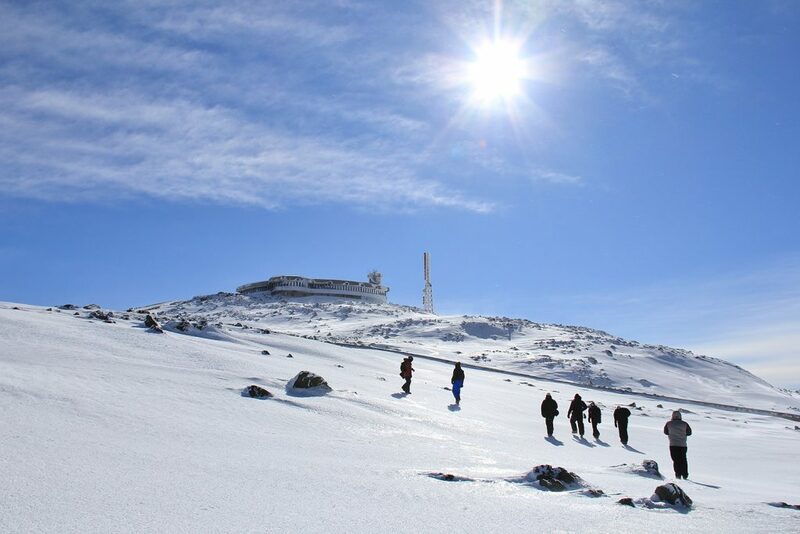 The Mount Washington Observatory is a 24/7/365 operation. As a result, one of us works through the night. Since I have been working nights, good lighting is imperative. My go-to is the Princeton Tec Apex Pro. It has great battery life, is lightweight, and has either an energy-efficient mode or a super-bright mode for those times when dense fog and blowing snow limit visibility to just feet. During the winter, we see brutally cold temperatures and high winds. If we’re improperly covered, these factors can lead to frostbite on exposed skin. That is where having good head and face protection is important. When I go out, I usually use a dual-layering system for breathability and warmth. The first layer is a Seirus Combo Scarf followed by an EMS® Power Stretch Balaclava. For warmth, I wear the Feather Pack. It is very warm, and for those times I go out hiking, I can pack it within itself, making it easy to transport without taking up significant space in my bag. For great rain and wind protection, the EMS® Helix Jacket has deep pockets that allow me to carry some of my essentials. And, while it locks out the rain and wind, it also has the option to unzip the underarm vents, which let air in when the weather is mixed and changing every 10 minutes, like it does in New England. For my lower half, I go with the EMS® Freescape Insulated Pants. They are very warm and protect against the rain and winds, too. However, when I am indoors, they are breathable, so I am comfortable practically anywhere. For my feet, I typically start with a pair of Darn Tough socks and then put on a pair of Vasque Snowblime Ultradry Boots. With this combo, my toes and feet are warm and toasty, even in spite of how far the mercury plunges. For hands, I go with the EMS® Altitude Mittens. For keeping hands warm, it is scientifically proven that mittens are a better option than gloves. However, because these have an inner liner, you can also take your hands out for a limited time when you need the added dexterity that mittens can sometimes inhibit. 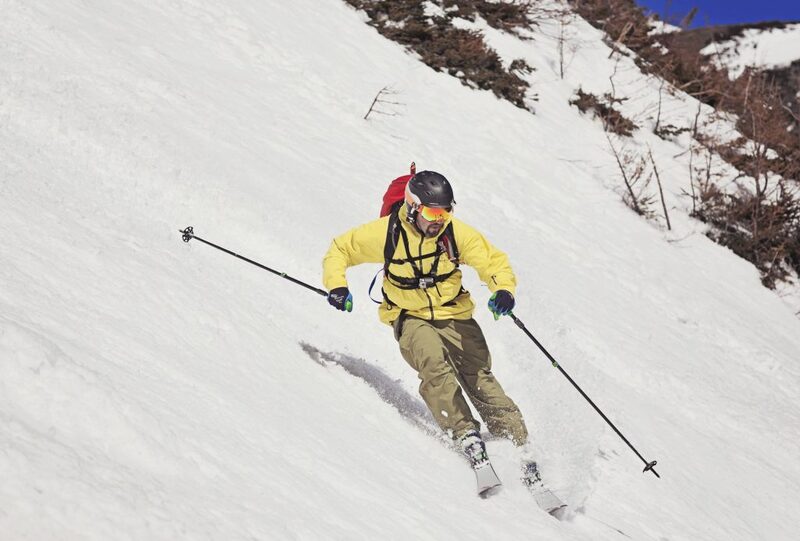 The last need is eye protection, and here, I would suggest the Julbo Universe Goggles. They are comfortable, they have a wide viewing area, and their lens adjusts on those days when clouds and fog are passing by, allowing for a bit of sunshine to mix in for uneven light. 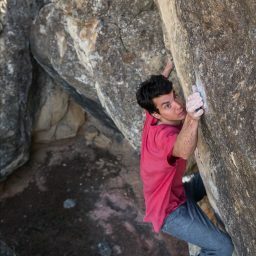 Born in New Jersey, Paul Robinson is a rock climber and boulderer who only uses the best gear out on his vertical journeys. I climb five days a week, and having a pair of shoes for the long haul is what I need! The Evolv Shamans are my go-to shoes for the gym and outside. They’re great for all angles, from slab to super-steep roofs! Most people just buy the cheapest chalk out there. I used to do the same, until I found out how much better performing FrictionLabs’ stuff is. The Gorilla Grip is a great combination of chunky chalk and a nice powder. It lasts so much longer than regular chalk and creates the best grip between you and the rock. You need to have a chalk bag, so why not have one with a zipper to hold some accessories and your keys? For these features, try the BD Mojo. Finding out you left your keys at the crag when you get back to the car at the end of the day is the worst! Black Diamond’s Ozone Harness is super comfortable and durable. It’s lightweight and great for those send attempts, but also gives you enough to work a route with. 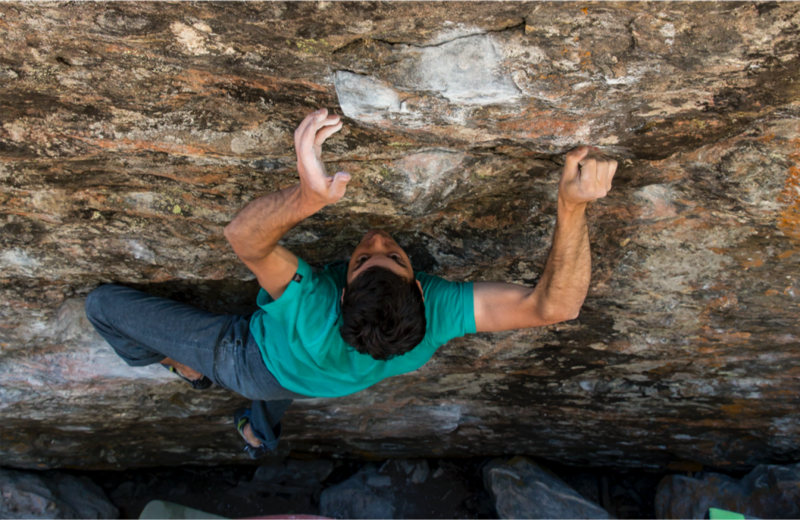 Winter is coming, and we need to stay warm out at the crag. The prAna Barringer Hoodie is lightweight but warm, so you can take it off easily before a climb or leave it on and climb in it! Flexibility is key when climbing. PrAna makes the absolute best pants for that, including the Stretch Zion. They’re super durable and will last for years. These are the pair I wear almost daily and come on every trip with me. The Keller Crew is a great top for climbing when it’s cold outside and a T-shirt is not enough. 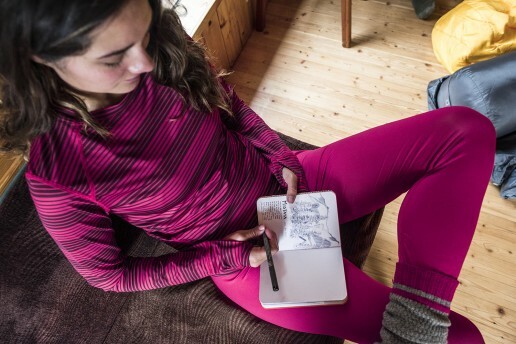 If it gets sunny and warm this holiday season while you’re out climbing, you still need to have a base layer, so why not pick a cool-looking one that photographs well? For all of these needs, check out the Mateo Crew. After all, everyone needs a good Instagram photo! Super bright and lightweight, the BD Spot Headlamp is something I always have in my bag. As the days get shorter, you never know when you are going to be hiking out after dark, so it’s always good to make sure you have a light to get you out. The EMS Wheeled Camp Duffel is the perfect travel bag, as it’s lightweight and super durable. Pack this thing up, and go on a trip for a week or six months—the options are limitless. I travel to far off places frequently, so having a satellite phone like the Spot Global is essential for getting help if necessary. In the backcountry, it is always nice to have that extra sense of security. A mom’s job is to keep her kids safe and grounded while simultaneously letting them find their wings. It’s an interesting dilemma. I truly do not know how my daughter got into climbing. Maybe it was TV or that climbing wall at the state fair, but it resonated with her. Almost as a result, when she moved to Golden, Colorado, for an internship when she was 20, she promptly called me to say, “I’m not coming home.” For her, I think Golden had the perfect combination of cliffs, mountains, and opportunities. In staying there, she is now the online store manager for the American Alpine Club. Personally, I had always hoped she’d become a guide, but there’s still time. Every famous climber has a mom, but this is a story about how any mom can help her kid become fearless and, well, a badass. I had never climbed, so she didn’t get it from me. In fact, I can’t really recall when my daughter first climbed anything more than shimmying herself up doorways. Stemming was not a part of her vocabulary yet, and how far could she have really fallen? The reality is, she wanted to learn to climb—really climb. Now, support doesn’t always mean money, although that helps. I had always tried to make sure she had the chance to learn, practice, and do. And, I learned all I could about climbing, myself. In fact, I probably did more research and reading than she did on it, but I wanted to make sure she had all the opportunities she could want. When she was 14, she didn’t know anyone from school who climbed, even though we lived in spitting distance of the Gunks. So, as a responsible mom, I signed her up for the beginning climbing course at Eastern Mountain Sports. After I signed all the waivers, off she went with Eric from EMS to finally climb for real. I remember waiting in the parking lot, worried that they were late coming back, but you have to have faith in the people leading the activity. When they got back, she was ecstatic. It was all she had hoped for and more. After a few more lessons and some indoor climbing, I realized this wasn’t just a phase. She also became interested in mountain climbing. She wanted to climb Mt. Washington in the winter, so, when she had just turned 16, we made a December trip up to North Conway for her to do EMS’s overnight at the Mt. Washington Observatory. There, she learned all about self-arrest, ice axes, and much more. At first, they weren’t sure about her coming along, since she was only 16 and I wasn’t accompanying her, but they saw how much she wanted to do this and that she was in great shape. She was determined, and I was committed to making sure she had the opportunity. Conquering the highest mountain in the Northeast ended up being a great experience for her, and I knew she was in good hands. I also knew this was just the beginning. Now came the challenge. How do I get her out there again? 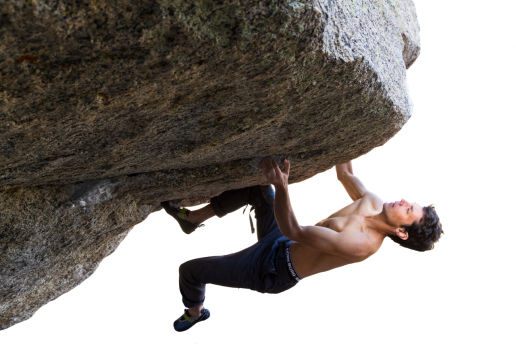 Unless you’re Alex Honnold, it’s a two-person adventure. To get involved, I arranged a private lesson with Peter at EMS about setting up top ropes, which she learned how to do while I figured out belaying. We then spent every opportunity we could at Mohonk Preserve to climb the world’s most famous one-pitch routes (because I was a better belayer than a climber). She could finally get out a lot more. The next terrifying step in her progression was ice climbing. A few months after Mt. Washington, she tried her hand at that, once again with EMS. When they got back that evening, she told me about how the person above her on the wall had the ice tool slip out of his hand and come down on hers. Luckily, it was the tool’s less-dangerous end and only caused a slight gash, but it was her first real climbing injury. Some moms might have said, “That’s it—you’re done,” but that might not have gone over well. This is probably the hardest rule. By the time she was 17, she was rock (top rope and multi-pitch), ice, and mountain climbing, but it wasn’t until college that she actually had friends who did this stuff with her. 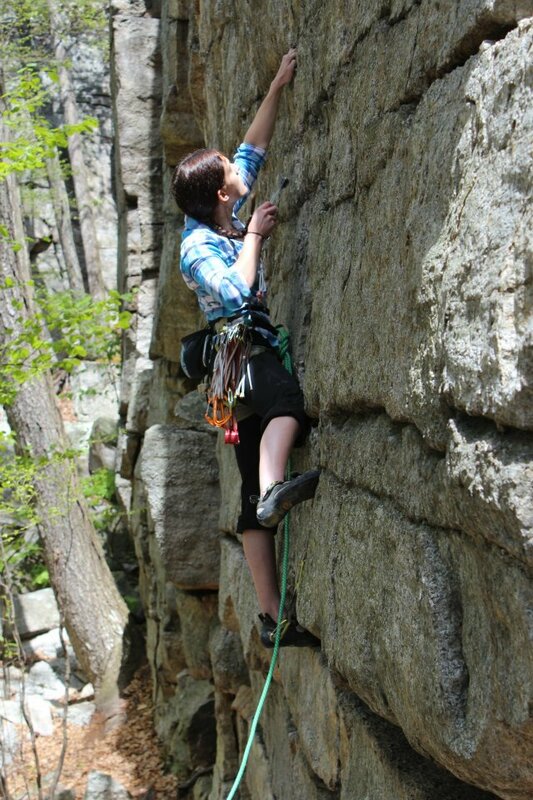 As a member of her school’s outdoor club, she led hikes and climbing day trips to the Gunks. Honestly, I kind of missed spending the time with her, but you have to let your kids grow, even if that means they grow away from you. At some point, you have to have faith that they know what they’re doing. She was extremely responsible. Safety has always come first, and that’s one reason I made sure she had professional help along the way. I joke that when I’m with her at least I’m under adult supervision. Ultimately, though, You have to trust them. Do I worry? Not much, actually. If anyone will make the right decision, I know she will. And she proves it every time she goes out. This wasn’t actually a problem for me, since she was very good at taking control. I think that comes from climbing. 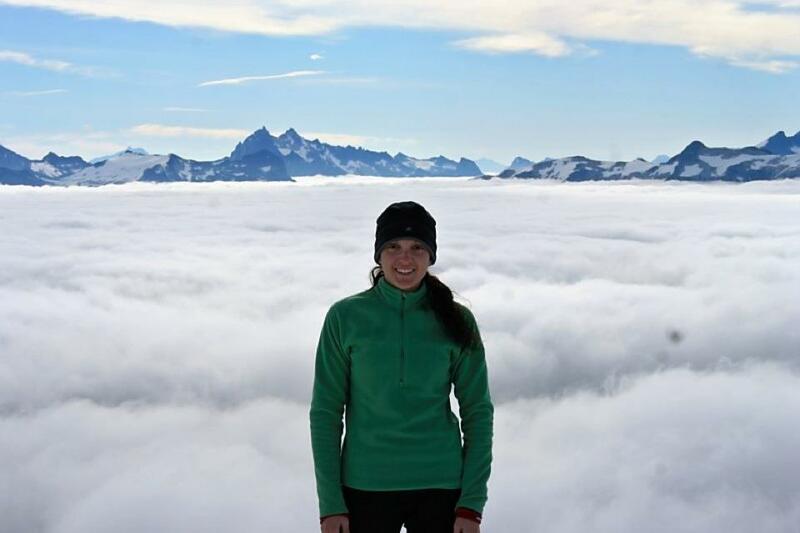 At 18, she wanted to climb Mt. Shuksan with a guide company outside of Seattle, so I got her a hotel room, all paid for, and a plane ticket. I remember that, when I was 18, I had no problem traveling by myself, so I knew she would be fine. I called her about the time I thought she would be at the hotel, but she rather rudely told me she’d have to call back and that she was busy. An hour later, she calls. Apparently, I found out, you have to be 21 to rent a room in Seattle. The hotel was not going to let her register, since she wasn’t 21. Instead of crying to mommy, she told them she wanted to speak with the manager. She advised him that her mother had paid for the room already and that they had a choice: Let her have the room, or she was going to sleep in their lobby. They made a concession and let her have the room. 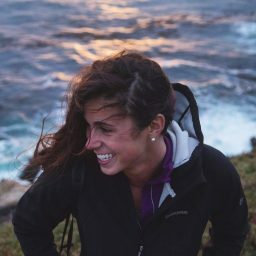 When she was 19, I saw on Facebook that the American Climber Science Program, in conjunction with the American Alpine Club, was looking for climbers to spend up to 10 weeks of the summer in Peru as part of an expedition. It wasn’t cheap, but it looked like an unbelievable opportunity, with seven mountains they were going to climb to take snow samples, measure glaciers, and document foliage. Some of these mountains in the Cordillera Blanca are over 20,000 feet tall. I believe part of being a mom is helping your kids not to be afraid of pushing their limits. At that point, she’d never been out for that long in those conditions or at a high altitude. The medical release was frightening. The battery of immunizations and medications, including for malaria, didn’t relieve any parental anxiety, either, but when would she ever get a chance like this again? For the first time, she wasn’t in the protection of a guide service, and she was thousands of miles away in another country, most of the time completely out of contact with anyone. Those were very long days as a mom, but I knew no call was probably the best sign. At 19, she was the team’s youngest member. I followed on Facebook and could track where she was and how she was doing. It was great to see her making friends, laughing, learning the cultures, and finding her place in the world of mountain climbing. She came back, saying she loved it. On one climb, she got to lead the rope team and was second in the line the rest of the time. The leader of the expedition told me he couldn’t have done it without her. Now, maybe that was what he told all the moms, but I’ll take him at his word. I still look back on those photos in awe of what she accomplished. She’s now 23 and on her own in Colorado, still climbing. She inspires me so much that I even climbed Mt. Washington myself. It was the summer…but still.